The Xian factory reverse-engineered the MiG-21 and the resulting J-7 made its first flight in December 1964. Two years later, manufacture halted because of unexplained technical problems after only 70 had been built. The early model J7I can be seen as the first variant of the type of full production standard. One difference with the MiG-21F-13 is the drag chute housing at the base of the tail. Meanwhile, in the common cause of communism, China was allowing Soviet supplies to pass through its territory bound for Vietnam, where the USA was embroiled in conflict. One day, several railway wagons containing dismantled MiG-21s went astray, and subsequently the J-7 re-en­tered production in modified form at Chengdu. The new J-7 II, a considerably upgraded Chinese development, entered production in the early 1980s, and by 1982 was being exported as the F-7B. China (Giuzhou) also produces the JJ-7 two-seat operational trainer, designated FT-7 for export (first flown in 1981). The JJ-7 dual seat version was originally built by Guizhou Aviation Industry Group (GAIG). Despite Chinese denials, a number of F-7s have been confirmed in Iranian service, while Iraq has also received the type via assembly (by Chinese technicians) in Egypt. Details of the latest export version of the Chinese-built MiG-21 were released in 1984. Known as the F-7M Airguard and (as offered to Pakistan) F-7P Skybolt, this variant of the earlier F-7B is extensively modernised with Western avionics including ranging radar, a weapons aiming computer, a headup display, multimode radios, and IFF. Two additional wing hardpoints are fitted, and two fuselage cannon are carried, rather than the one carried by earlier models. Other changes include a revised canopy, an updated ejection seat, and a relocated brake-parachute housing. With development of a successor to the J-7 (MiG-21) that formed the backbone of the PLAAF taking far longer than hoped, Chengdu began efforts to modernize the design. Work began in 1987, resulting in a major design overhaul. The wings were redesigned to have a double-delta planform, and the engine was replaced with a WP-13F engine. The primitive radar of the J-7 was replaced with the British Super Skyranger radar, and fuel capacity was increased. The modifications improved turn performance, and the takeoff roll was reduced from 1km to 600m. Upgrades to the cockpit included HOTAS controls, as well as the later addition of a helmet-mounted sight. Development proceeded quickly, with the first J-7E, as the new model was known, flying in 1990. By the time the J-7E came about, most J-7 operators had since moved on to more capable designs. 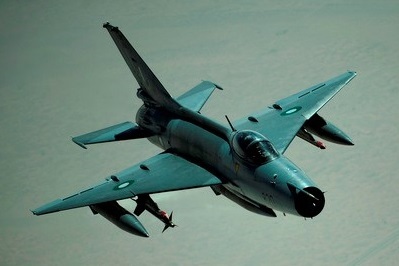 However, Pakistan, the largest non-Chinese J-7 operator, ordered significant numbers of the type. A special variant was developed to meet Pakistani requirements, integrating new western radars and the capability to mount AIM-9 AAMs. Ever eager to develop anti-shipping platforms, the PLANAF also ordered a special J-7 variant with the ability to deploy AShMs (J-7EH). The J-7EH features the ability to carry antiship missiles, but, due to limitations with the radar, must receive targeting data from other aircraft. After the final deliveries to Bangladesh, Chengdu shut down J-7 production in May 2013, marking the end of a 2,400 aircraft production run.